Be the first to share your favorite memory, photo or story of Conroy. This memorial page is dedicated for family, friends and future generations to celebrate the life of their loved one. 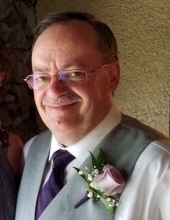 Conroy J. Soik, 56, Junction City, passed away peacefully at his home on Thursday, April 4, 2019. A memorial service will be held at 11:00 am on Tuesday, April 30, 2019 at Faith Fellowship Church, 217 West McMillan Street, Marshfield. Conroy was born on October 16, 1962 in Stevens Point, to Myron and Frances (Firkus) Soik. He was a 1981 graduate of Stevens Point Area Senior High and a 1985 graduate of the University of Wisconsin, River Falls. He married Mary L. Trelka on November 14, 1986 in Stevens Point, Wisconsin. Conroy and Mary were husband and wife, business partners and best friends and had an absolutely wonderful life together. They became part of Culver’s family in 2002. Conroy’s life evolved around Mary and their children. He enjoyed the Texas Holdem bar league in Green Bay and his apple trees. He was Mary’s number one barrel racing fan and he and Mary polka’d together beautifully. He is lovingly survived by his wife, Mary and their children, Samantha Soik (Chad Nooyen), CJ Soik, Katie (Dylan Suchocki) and Cassidy Soik (Jeremy Becker) and grandchildren, Wyatt and Leo and more to come. He is also survived by his father, Myron Soik, Stevens Point, and siblings, Curt Soik, Stevens Point, Michelle (Kevin) Wasieleski, Plover, Bruce (Stacey) Soik, Stevens Point, Mark (Barb) Soik, Stevens Point, Judi (Ron) Gosh, Amherst and Lynda (Kevin) Schroeder, Plover and a sister-in-law, Lyndel Soik of Stevens Point. He is further survived by many nieces and nephews and great nieces and nephews. He was preceded in death by his mother, Frances, beloved grandparents, Felix and Regina Soik and Edward Firkus, grandmother, Margaret Firkus and step grandmother, Helen Firkus. A special thanks to everyone who loved him. In lieu of flowers, please surprise someone with a random act of kindness. "Email Address" would like to share the life celebration of Conroy J. Soik. Click on the "link" to go to share a favorite memory or leave a condolence message for the family.